Fabio graduated in Finance & Economics from Bocconi University, Milan in 1991. He worked for JP Morgan and Gemina Capital Markets in Milan and for UBS in London and Lugano. 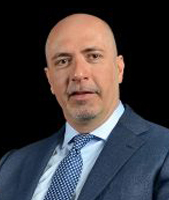 In 1998 Fabio joined Assogestioni as head of research. He was appointed Director General in 2002. He has served in several self-regulatory and consultative bodies both domestically and internationally. Since 1999 Fabio has been a member of the board of directors of EFAMA and is currently chairing the AIFMD Committee and Remuneration Committee. Since 2009 he is a member of the board of directors of Pensions Europe and is currently chairing its Shareholders Rights Directive working group. Since 2011 he is a member of the board of Italian Corporate Governance Committee which is the main self-regulatory body for listed companies in Italy. Assogestioni is the Italian Investment Management Association. Members of Assogestioni manage more than 2.000 billion euro in the form of investment funds, segregated portfolios, pension funds and real estate funds. Assogestioni has a staff of 35 in Milan and Rome.